Heinrich Heine (1797-1856) was a major German poet, some of whose poems were set to music by Schumann, Schubert and others. His earlier poems tended to be lyrical: some of his later ones were more satirical. 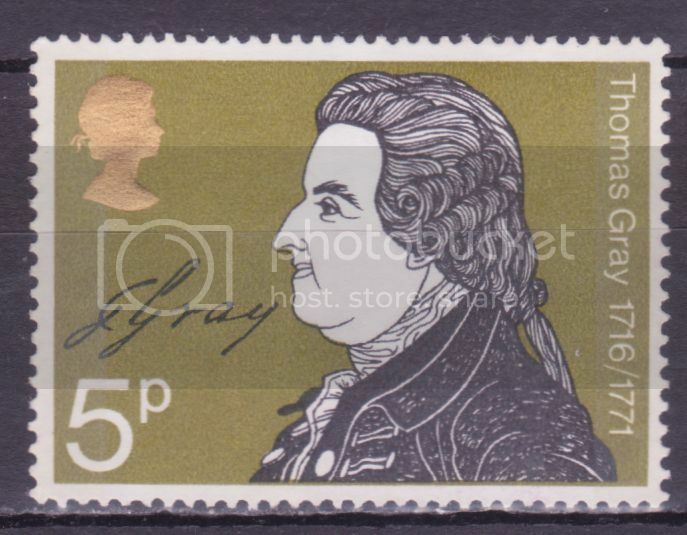 In 1972 West Germany issued a stamp to mark the 175th anniversary of his birth, SG 1644. 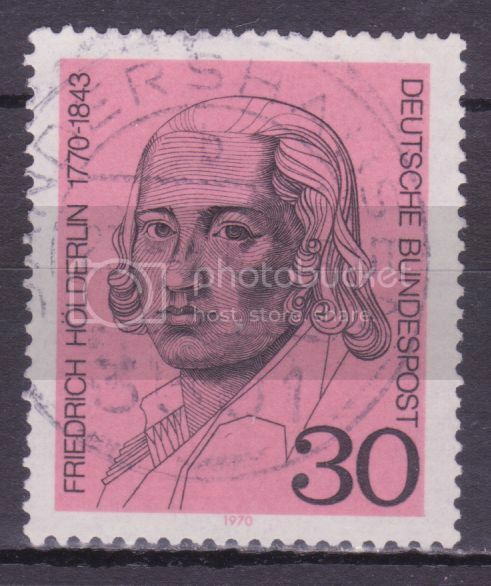 Friedrich Holderlin (1770-1843) was a leading German romantic poet, although it was only some years after his death that his poems really began to be fully appreciated. For the second part of his life he was treated for mental illness, and lodged with a well-read carpenter. From the mid 19th century his poems began to be set to music by leading composers. Here he is on a 1970 West German stamp marking the bicentenary of his birth - SG 1518. Ralph Waldo Ellison (1914-1994) was named by his book-loving father for poet Ralph Waldo Emerson. Young Ralph inherited a lifelong fondness for literature and became a popular writer like his namesake. While still young, Ellison was a self-proclaimed Renaissance man. His wide-ranging interests included music, sculpting, constructing audio equipment, and writing. He went to Tuskegee Institute on a music scholarship. But a summer in New York City changed his focus and the course of his life. After working for the Federal Writers Program and submitting book reviews, Ellison was encouraged to pursue a career as an author. His essays were well received, but could not compare to the reception of his novel, Invisible Man. Published in 1952, the book dealt with issues of racial prejudice and the search for personal identity. A new type of black character was introduced, a man who was educated and well spoken. In the book, the narrator calls himself invisible because “people refuse to see” him. Ellison went on to write many significant essays, but the only book published during his lifetime made the largest impact. The mark left by Invisible Man continues to be felt in literature and throughout American culture. Blaise Cendrars (1887-1961) was a novelist and poet who was born in Switzerland and became a French citizen in 1916. He acquired fame initially as a modernist poet, but abandoned poetry in the 1920s, thereafter writing fiction and autobiographical works. He was also involved in films and radio. 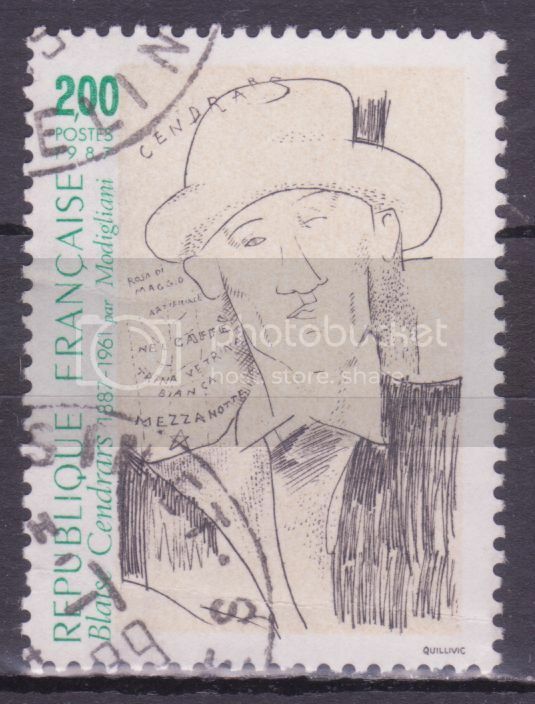 Here he is on a 1987 French stamp, SG 2792, based on a drawing by the famous artist Modigliani. Henryk Sienkewicz (1846-1916) was a Polish writer best known outside his native land for Quo Vadis, a novel about the early Christians in Rome. In 1905 he was awarded the Nobel Prize for literature. 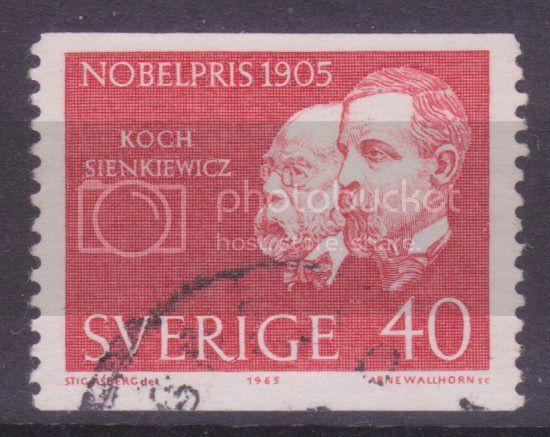 In 1965 Sweden issued a stamp, SG 489, showing him on the right, and to his left, Robert Koch, who won the 1905 Nobel Prize for medicine, and who did a lot of pioneering work on bacteriology and infectious diseases, including TB, cholera and anthrax. 1921 was the 600th anniversary of the death of Dante (born in about 1265). Dante was one of the most influential European poets there have ever been. He did much to break the partial stranglehold of Latin on serious Western European literature, showing that it was possible to write a great epic in the vernacular. His work helped to shape the Italian language. His greatest work is The Divine Comedy (Divina Comedia), in which the poet is guided through Hell, Purgatory and Paradise in three successive books. 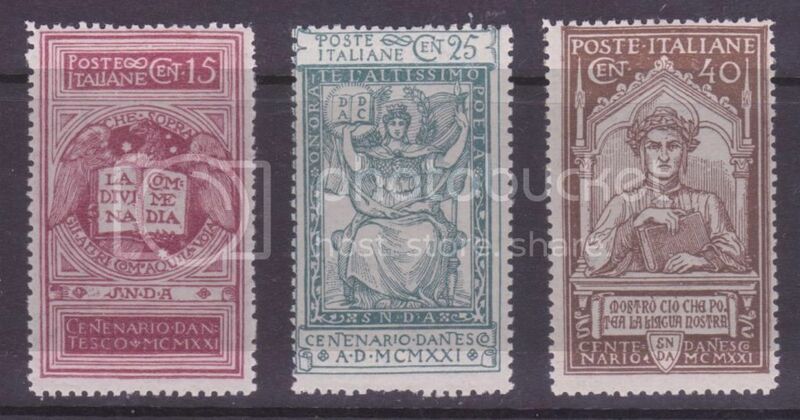 Here is a set of three stamps issued by Italy in 1921, SG 115-117. The highest value shows the poet himself; the lowest, his epic masterpiece. I think the middle stamp shows a mythical figure - probably a Muse - honouring him as the greatest poet: the figure shows an open book, and the DA on the left-hand page probably refers to Dante Alighieri, the DC on the right-hand page to the Divina Comedia. Thanks, @craig. So do I! Erasmus (1469-1536) was a Dutch humanist and one of the great figures of the Renaissance in Northern Europe. He worked on new and more accurate editions of the New Testament in Latin and Greek. He maintained an extensive correspondence with leading humanists in other countries. For his own works he wrote in Latin - then the common international language for scholars. As a writer his most famous work is The Praise of Folly, in which he satirised some of the corruption and superstitions of the Roman Catholic church of his time. It was a best seller, and even a Pope appreciated its humour. In 1969 the Netherlands issued a stamp to mark the quincentenary of his birth - SG 1096. August Strindberg (1849-1912) was a Swedish author best known for his plays, though he first came to general attention through a novel, The Red Room. He was a major influence on a number of 20th century playwrights, among them Tennessee Williams, Eugene O'Neill and John Osborne. Among his plays are Miss Julie, The Ghost Sonata, The Father and The Dance of Death. They explore intense and tormented personal relationships. In 1949 Sweden issued a set of three stamps for the centenary of his birth, SG 310-312. Robert Burns (1759-1796) will be familiar to most of you, if only for Auld Lang Syne, so familiar from New Year celebrations. 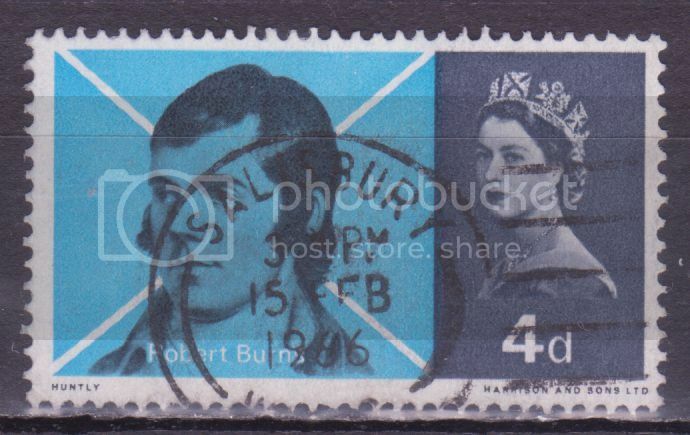 Here he is on a GB stamp of 1966, SG 685. Thomas Gray (1716-1771) was an 18th century poet who is most remembered for his Elegy Written in a Country Churchyard, a meditation on death which was compulsory reading for many schoolchildren in my childhood. Among his other works is a delightful light poem, Ode on the Death of a Favourite Cat, Drowned in a Tub of Gold Fishes, which you can find here, complete with illustrations. 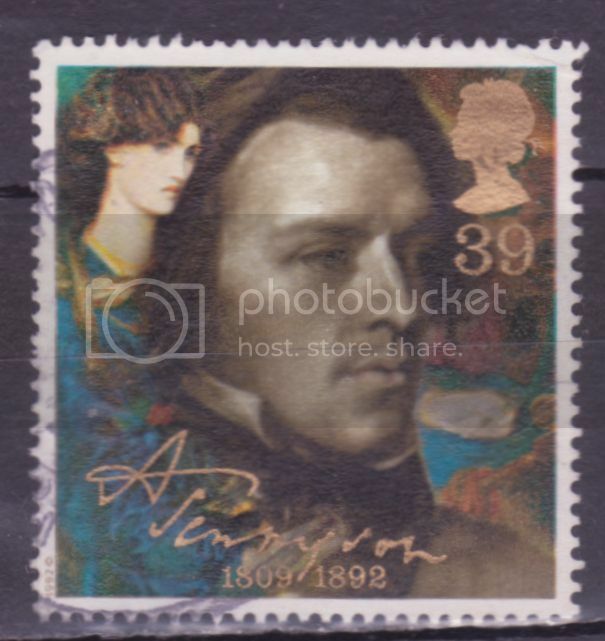 Here he is on a GB stamp for his death bicenenary, SG 885. 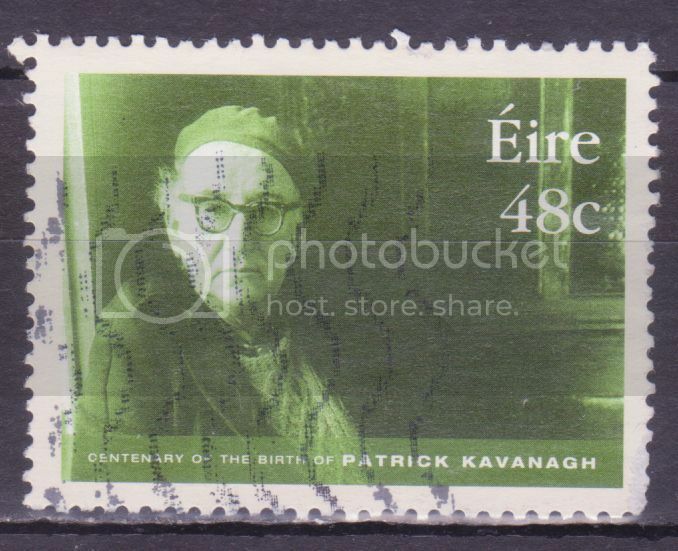 In 2004 Ireland issued a stamp, SG 1709, for the birth centenary of the poet Patrick Kavanagh (1904-1967), best known for his realistic poetry about rural Ireland, including a long poem about the potato famine of the 19th century, The Great Hunger. Among those influenced by his work was the Nobel laureate Seamus Heaney, who died in 2013. 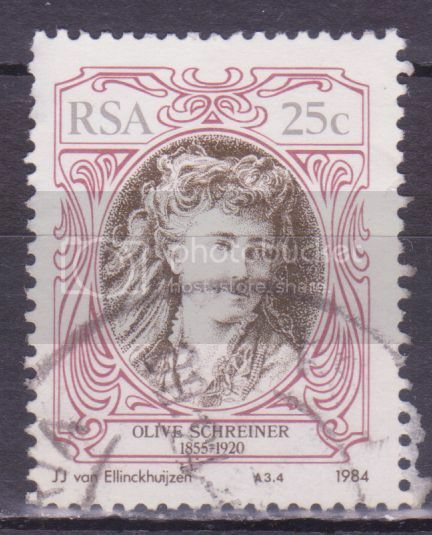 In 1984 South Africa issued a set of three stamps featuring English-language authors, the best-known of whom was Olive Schreiner (1855-1920), most famous for The Story of an African Farm. SG 556. W B Yeats (1865-1939) was a towering figure of Irish literature. Poet and playwright, he was awarded the Nobel prize in 1923 - but much of his best work dates from later. I discovered his poetry in my teens, and have admired many of his poems ever since. Some of them are political - for instance, he did not shy away from the difficult subject of the Irish Civil War. In his last years he found a new freedom of expression which led to some of his greatest poems. He served two terms as a member of the Irish senate; and on occasion he condemned in forthright terms the increasing influence of the Roman Catholic church in the Republic of Ireland during the 1920s. 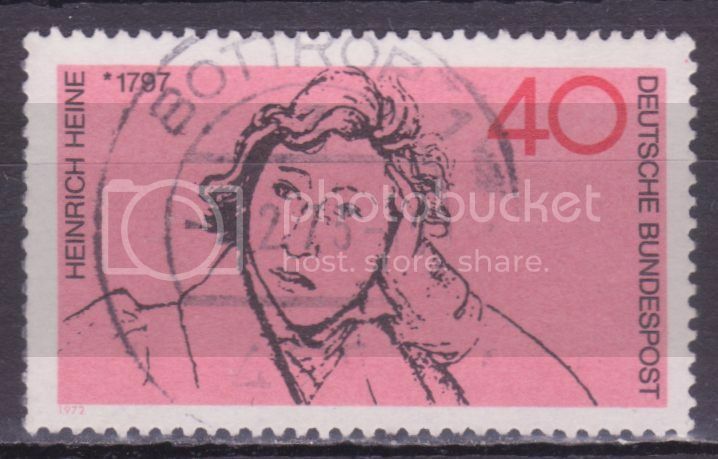 In 1965 Ireland issued a pair of stamps for his birth bicentenary: here is SG 207. Many of you will have read at least the first two books of Gulliver's Travels, set in Lilliput and Brobdingnag, even if only in an expurgated version in childhood. Its author, Jonathan Swift, lived from 1667 to 1745 and in 1967 Ireland issued a pair of stamps for the tercentenary of his birth. One of them shows the man himself - SG 237. Swift is widely regarded as the greatest satirical writer of prose in English. Among his other works is A Modest Proposal, a savage satirical denunciation of the treatment of the Irish poor in which he presents, in deadpan style, a reasoned proposal that the Irish should relieve their poverty by selling their children to be cooked and eaten at the tables of the gentry. The Whig government tried, unsuccessfully, to use the courts to silence him and prevent him writing critical pamphlets. He also wrote some fine poems. Alas, he was treated for insanity over his last years - possibly the result of a major stroke. In his Will he left most of his assets to found a hospital for the mentally ill in Dublin. Maxim Gorky (1868-1936) was a major Russian writer who is best known for realistic fiction. His best-known work is probably The Mother (1906), about revolutionary factory workers: there are several film versions. His relationship with the Russian authorities - both Tsarist and communist - was always difficult. He was arrested a number of times for political opposition under the Tsars: but, though close to the Bolsheviks, he was at times publicly critical of Lenin. He spent many years abroad, for political and health reasons. In 1932 Stalin personally invited him to return to Russia, which he did, only to be placed under house arrest two years later. 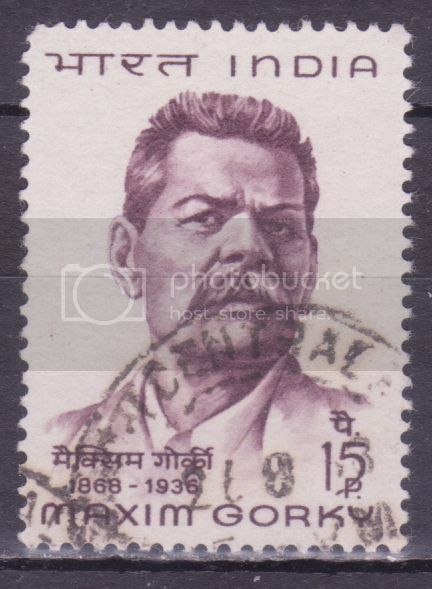 Here he is on an Indian stamp, SG 563, to mark his birth centenary in 1968. 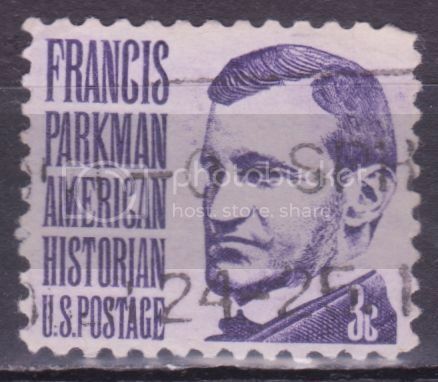 Francis Parkman (1823-1893) was a historian most famous for The Oregon Trail, a large part of which is concerned with a trip he undertook with the Sioux hunting buffalo. He was also an esteemed horticulturalist. He is featured on a US stamp issued in 1967, SG 1262.